The world of digital media is changing at a phenomenal pace. Constantly evolving technologies are transforming not just how we access our information but how we interact and communicate with one another on a global scale. Understanding Digital Marketing is a practical, no-nonsense guide to web-marketing, the rules of new media and researching the new generation of digital consumers. Clear, informative and entertaining, it covers key topics such as search marketing, social media, Google, mobile marketing, affiliate marketing, email marketing, performance marketing, customer engagement and digital marketing strategies. 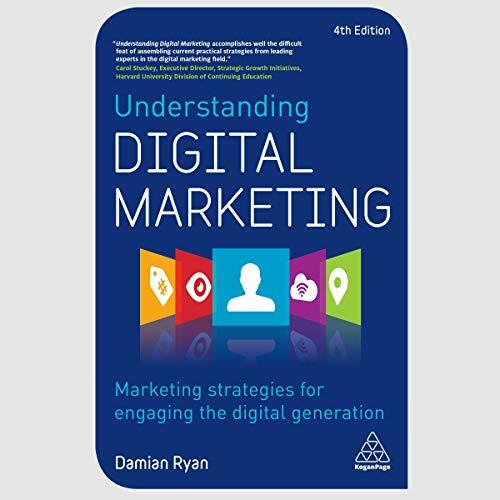 One of the best-selling books in the industry, this fourth edition of Understanding Digital Marketing has been thoroughly revised with more information, fresh examples and case studies, and the latest developments in the industry. Complete with in-depth insider accounts of digital marketing successes from internationally recognized brands and digital marketing campaigns, it is essential listening for both practitioners and students alike. Understanding Digital Marketing is now required material for more than 100 universities and colleges, including Harvard University and the Chartered Institute of Marketing. Online resources include bonus chapters, contributor views, and case studies on Kwik Fit, Battersea Dogs Home and Yves Saint Laurent. ©2009, 2012, 2014, 2017 Damian Ryan (P)2019 Brilliance Publishing, Inc., all rights reserved. Good ideas and strategies for digital marketers. A lot of suggestions what can you do to improve. Also reccomendations for additional books about UX or topic you are deeply interested.